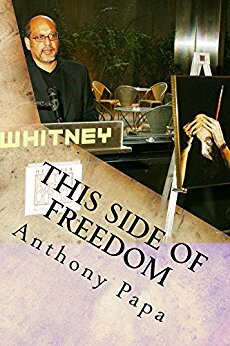 This Side of Freedom: Life After Clemency is a riveting, compelling tale about the life of activist, writer and artist Anthony Papa. He tells firsthand of his experience of returning home after serving 12 years of a 15-to-life sentence for a non-violent drug crime sentenced under the mandatory provisions of the Rockefeller Drug Laws of New York State. In 1997 he was granted executive clemency by New York Governor George Pataki. Papa says that the freedom he fought so hard to get, smacked him swiftly in the face, overpowering him. He struggles with his freedom while fighting to free those he left behind. Papa goes through heart-wrenching trials and tribulations as he seeks to end the war on drugs. Along the way he meets an array of individuals from famous movie stars to politicians and the very rich, enlisting their help in doing away with mass incarceration and draconian sentencing laws that have destroyed America's criminal justice system. This Side of Freedom: Life After Clemency can be purchased here.